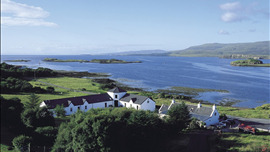 An enviable location on the shores of Loch Bay – a pebble's throw from the sea – draws visitors to Michael Smith's restaurant which he runs with his wife Laurence. A talented chef who led the kitchen at the well-regarded The Three Chimneys in Colbost for some 10 years, where he was awarded a prestigious star in 2015. A cosy and inviting restaurant with contemporary high backed chairs set against polished wood tables and walls decorated with pretty shaped mirrors. As you would expect given the location, seafood looms large on the menu, dishes are simple in concept and freshness, bursting with natural flavour. Emphasising contemporary Scottish cuisine with classic French influences diners have the choice of a three course dinner menu, alongside a five course seafood tasting menu, as well as a lunch menu. To kick start proceedings you might choose the short rib and onglet of beef served with neeps, syboes and parsley relish before a main course of Highland pigeon and hare with cauliflower, Chanterelles and spiced bacon or from the sea there's Mallaig turbot with summer vegetables and white wine. To finish order the classic clootie dumpling paired with whisky cream or you could opt for the selection of Scottish and French cheeses. There's a carefully constructed selection of wines to accompany the food and deft service injects warmth into the experience. The restaurant was awarded a prestigious Michelin star in the 2018 edition of the Guide. Eddie and Shirley Spear's Gold 5-Star restaurant-with-rooms occupies a remote spot far away from the madding crowd, in a tiny village close to the Colbost Folk Museum.